Over time, the gums can pull back or recede to show the roots of your teeth, making them more susceptible to decay since they are not protected by enamel. The extra space created around your teeth from recessed gums can also allow bacteria to accumulate and develop into gum disease. Ultimately, if not given proper treatment, the tissue and bone structure surrounding your teeth can be seriously harmed and even cause your teeth to fall out. Due to these severe consequences, if you see signs of gum recession, you should seek treatment as soon as possible. WHAT ARE LASER GUM DISEASE TREATMENTS? Laser periodontal techniques can improve the effects of gum disease and prevent the condition from getting worse. Gum disease in various stages affects millions of people across America – even those with exceptional oral hygiene routines. 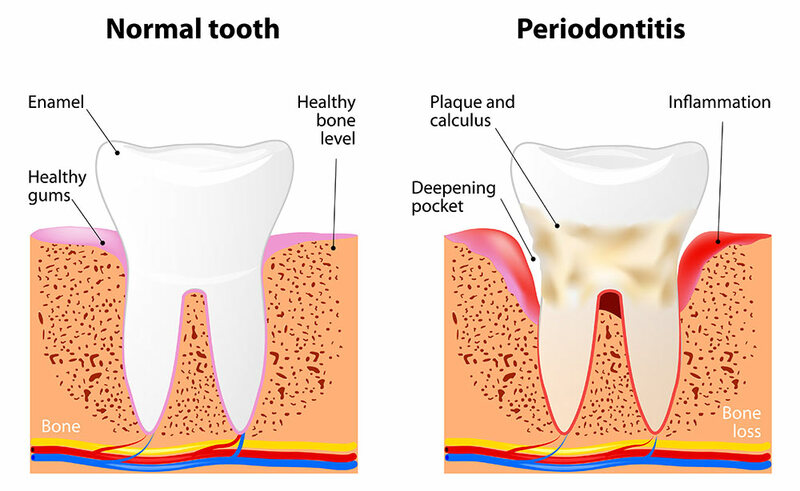 The condition is caused by plaque and bacteria invading the soft tissues surrounding the teeth and can lead to redness, bleeding gums, tooth decay, and even tooth loss. Gum disease can even increase the risk of overall health problems. Dr. Lunn and his experienced dental team at Highlands Ranch Family Dental can use laser technology to remove harmful bacteria from the gums in a quick, virtually painless procedure. This treatment also effectively seals the gums to the teeth for an improved aesthetic result. Scaling and root planing (SRP) is the most common and conservative form of treatment for periodontal (gum) disease. Scaling is the removal of calculus (commonly called tartar) and plaque that attach to the tooth surfaces. The process especially targets the area below the gum line along the root. Plaque is colonies of bacteria that form on teeth and when the plaque hardens on the tooth and root it is called calculus. Plaque is more likely to stick to rough surfaces. For this reason, the root surface is made smooth in a process called root planing. Root planing removes any remaining calculus and smooths any irregular areas of the root surface. In addition, the use of lasers as an adjunct to scaling and root planing (SRP) improve the effectiveness of this procedure. When the lasers are used during periodontal therapy there can be less bleeding, swelling and discomfort to the patient during surgery. The best part is that the recovery time is less than 24 hours so the patient can quickly return to their daily routine at home or work.